Click HERE to be directed to the hotels page for 2019. Hotels will be added as they finalize contracts. 2019 IS Stay and Play. Please use our hotel service, it is how we keep tournament costs down and pay for officials. Out of town teams will not be accepted without a confirmed hotel contract with Traveling Teams. 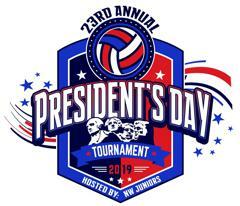 We invite everyone to join us for the best Presidents Weekend Tournament in the Northwest, now in our 23rd year, the 2019 President’s Day Weekend Tournament has evolved into one of the best three-day tournament values in the Northwest. Your entry fees are not paying for the rental of a big facility, convention center, or sport-court rentals — we are one of the last great multi-site tournaments. In attending the Northwest Juniors President’s Day Weekend Tournament, you can expect to find quality competition for teams of all ages and skill levels. This tournament will be held at various schools on over 24 courts in and around the South Seattle area (including Kent, Des Moines, Puyallup, Sumner, Renton, Tukwila, Burien). The tournament is a three-day wave progressive pool play format similar to that of a National Qualifier. Up officials are provided for all matches — all three days. AM wave is from 8 AM – 2 PM, PM wave is from 2:30 – 8:30 PM. We will provide the AES rosters to our tournament directors, so there is no need for you to print them out. You must bring your Webpoint roster with you to the coaches meeting. Only cross off the players that are not playing AT ALL this weekend. Canadian teams, bring the roster you created with the help of our region office. You will sign and turn in BOTH rosters at the coaches meeting Saturday. The AES roster is for our Tournament Directors Reference, The Webpoint rosters get posted and ultimately get turned into the region office for verification after the event. Because it is a multi-day tournament, you only turn in the roster on Saturday. Please double check your pools on Friday. We had a couple drops in each division Thursday that created 3-team pools. We had to make a few changes to include crossovers so that teams will still get their 3 matches each day of pool. It also changes the brackets. We will have a team information booklet for all the teams in the 18 Open. They will be available for you at Auburn High School. Your cost: leave a business card so we know you were here! We are getting a lot of emails about changing rosters because of unforeseen circumstances. At this time, you cannot modify your AES roster; your WEBPOINT roster is the official roster for the tournament, so make all necessary changes to your Webpoint roster - this is the roster you turn in at the coaches meeting on Saturday and this roster must be accurate. Once you turn in your Webpoint roster, you cannot make changes. We will have printed AES rosters at the coaches meeting and we will ask you to sign and (manually) update that roster AND turn in your official Webpoint roster. The Webpoint will stay at the HQ of the location you start, and the AES roster is our backup in case we need to contact you. You do not need to turn in rosters on Day 2 or 3. Up Officials are provided all three days; teams must supply a second referee, lines people, and score keeping crew during their officiating assignment. All pool play matches will be 2/3 to 25 points with a 27 point cap. Game 3 is to 15, no cap. At the coaches meeting: Rosters that coaches or club directors submitted into AES will be printed out ahead of time for you to verify and sign. We will also collect your signed “Webpoint” USAV Rosters. We will ask that you submit a phone number on the BOTH rosters so that our Tournament Director can contact you throughout the tournament if needed. THESE ROSTERS MUST MATCH AND CHANGES CAN ONLY BE MADE TO THE AES ROSTER. All coaches are required to carry their signed players’ Medical Release Forms with them at all times during the tournament. You do not need to submit these forms at the Coaches Meeting. Don't forget to wear pink on Day 2 of our event. Just one small way you can show support, via the Sideout Foundation and the Dig Pink Tour. Show your team’s support by wearing pink on the second day of every multi-day event. Coordinate with your team to create your own shirts or visit Shop Dig Pink® to order shirts, jerseys and more. Based on our past registrations and team limits, we plan on having following waves and number of teams. U16 Open Division expanded to 32 teams. This will allow us to seed some a limited number of the top U15's teams into the 16 Open Division. *We will split the 14 Club into two equally seeded 24-team divisions with the top teams from each division meeting in the Gold Finals on Monday in the same gym. U12's Will be 3 days starting in 2019! As in previous years, in the U14’s and U16′ age groups we will use region Power League rankings (as of the January Power League) to determine seeding. This year we encourage teams to register in whichever divison they feel their team belongs in based on their skill level. We reserve the right to move teams based on seeding and/or to balance the fields. Seeding in an inexact science, and we do our best to ensure teams are placed in the appropriate division and have a great experience. By selecting “Open” or “Club” you are not guaranteeing your entry into that division, however it does give our tournament director an idea of which division you feel your team should play in. It also helps us seed teams from the Evergreen Region and Canada who do not have a Power League. Coaches, note that we do not have the ability to add waivered players to AES rosters. That can only be done at the AES/USA Volleyball level. If you have waivered players, we are aware that they will not appear on your AES roster. As long as they are on your Webpoint roster -- WHICH YOU DO TURN IN AT THE COACHES MEETING -- then they will be legal to play this weekend. As stated in our tournament information, we no longer have a Friday night coaches meeting. You will have a coaches meeting on the first day of play at your play site. The meeting will occur 30 minutes before play begins. PM Wave teams please be patient, since this is the busiest time of the day for Tournament directors their first priority will be to get the AM wave pools finished and AM wave teams out. At the coaches meeting, your TD will go over facility rules and format changes that have occurred since the schedule was published in AES. They will have your AES roster for you to sign and verify. YOU WILL ALSO TURN IN YOUR USAV WEBPOINT ROSTER, which is your official tournament roster. Please make sure both rosters have your head coach's cell number in case we need to get a hold of them. Both rosters will be turned into the Puget Sound Region office after the event. For day 2 and day 3, you do not need to turn in a new roster. There will be a meeting before play begins only to go over the playing rules of the site. Entry Fees will be processed through Advanced Event Systems (AES) where you can pay online or send a check to “Northwest Volleyball Foundation (NWVBF, 15801 NE 85th St., Redmond, WA 98052). We will begin taking registrations starting October 1, 2018. Registration deadline will be when all divisions are filled (typically mid-January). There are no refunds after January 2, 2019. Any teams that have not inputted their rosters by 2/8/19 may be dropped from the tournament with no refund. At minimum, they will be assessed a $25 late-roster fee, due at the coaches meeting . We will update sites for 2019 as they are confirmed. Lakeridge MS was added 2/12/19 because Ct 3 of Mountain View MS was not available during PM Wave Saturday.